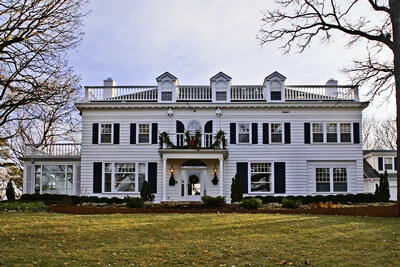 Located in the Highlands area of Madison’s west side, Brittingham House is the official residence of the University of Wisconsin System president. It is used frequently for receptions, business meetings, and other public events. The Brittingham House stands on a hilltop proudly overlooking the Highlands area of Madison’s west side. Thomas E. Brittingham and his wife, Mary Clark Brittingham, commissioned influential architect Frank Riley to build the elegant Georgian-style home in 1916. Because it was to be their final residence since their marriage in 1889, Mr. Brittingham dubbed the dwelling “Dunmuven,” a whimsical name by which the house is still known to members of the Brittingham family. “Dunmuven,” now known as the Brittingham House, circa 1916, the year it was built. 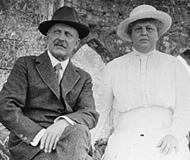 Thomas and Mary Brittingham, 1917.
business based in McFarland that ultimately grew into a chain that spanned Wisconsin and several other states. One of the most affluent Madisonians of his time, Thomas applied his good business sense to everything he did. As a generous benefactor, he held a number of high-profile civic positions, including chairman of the Wisconsin Board of Visitors of the University of Wisconsin, member of the Wisconsin State Historical Society Board of Curators, and member of the Board of Regents. Because of the connections he made with the university, he was granted the title of honorary alumnus. Mary Clark Brittingham (1868-1929), a native of Portland, Wisconsin, became an equally recognizable and beloved Madison resident. She graduated from the University of Wisconsin in 1889, with a Bachelors of Letters in the “Modern Classical Course” and was a proud member of the Gamma Phi Beta sorority. She was actively involved in the Women’s Club of Madison, a club that boasted similarly prominent women of her day including Mrs. Vilas, Mrs. La Follette, and Mrs. Atwood. During her 30 years as a club member, Mary served multiple terms as the organization’s chair of both the Education and Social committees, and helped to spearhead a number of the club’s initiatives, including integrating kindergarten programs in the city’s public schools and the early fundraising campaign that would help to create Madison General Hospital. Together, Thomas and Mary began a family tradition of generosity and service to the University of Wisconsin which continues today. One example is the statue of Abraham Lincoln in front of Bascom Hall, donated in 1909. At his death in 1924, Thomas left an estate in trust for the University of Wisconsin and for the city of Madison. The estate expanded to well over a million dollars through the efforts of Thomas Evans Brittingham, Jr., who followed in his father’s footsteps as a UW‑Madison benefactor. In 1925, he, along with eight other alumni, founded the Wisconsin Alumni Research Foundation (WARF). The foundation, which continues to benefit UW‑Madison today, was formed to protect and develop the ideas and patents of university faculty. The nine original trustees began with a capital of $900. Thomas Brittingham, Jr., parlayed that modest amount into $29 million by 1957 through an aggressive investment policy. 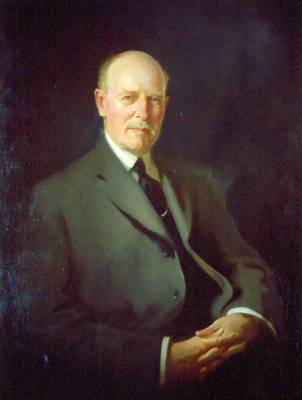 He was serving as WARF’s president when he died in 1960. Through the Brittingham University of Wisconsin Trust, Thomas Brittingham, Jr., also played a major role in the construction of the Alumni House on the UW‑Madison campus, offering to match $1 for every $2 raised for the facility. Perhaps his favorite project, however, was the scholarship program he established in 1952 to bring Scandinavian students to UW‑Madison. In 1963 “Tom’s Vikings” dedicated the Brittingham Boulder, a rune stone from Sweden placed near the top of Bascom Hill, to his memory. 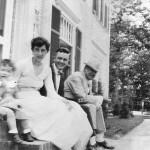 The Brittingham House remained a special place for Thomas, Jr. (1899-1960), his sister, Margaret Brittingham Reid (1892‑1966), and his brother, Harold Hixon Brittingham (1894‑1937), even after their parents’ deaths. Thomas, Jr. and Margaret continued to use “Dunmuven” as a summer home until 1955, when they donated the house and its 15‑acre grounds to the University of Wisconsin. Owen Conservation Park in The Highlands. 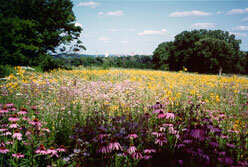 Owen’s former farm and personal retreat have since become the 93-acre Owen Conservation Park, sitting just across Old Sauk Road from the Brittingham House. When the Brittinghams purchased 30 acres from Owen in 1910, the area was unforested. It would not be until noted Chicago landscape architect O.C. Simonds would implement a planting plan, that the Highlands would become the woodland haven it is today. A Madisonian from birth, Frank M. Riley is one of the city’s most well-known early 20th-century architects. Riley began his studies at the University of Wisconsin, where his father was the secretary for the UW Board of Regents, but he ultimately earned his degree from MIT. Soon after, he traveled Europe where he used time in Britain, Italy and Germany to sharpen his architectural skills. When he finally returned to Madison after the outbreak of World War I, Riley quickly went to work building a legacy that would include some of the city’s most recognizable buildings, such as the Madison Club, the Governor’s mansion in Maple Bluff, and Madison East High School. The Brittingham family utilized Riley’s talents to build two additional homes, one in California and one in Maple Bluff for Thomas, Jr. Throughout his career, Riley insisted all of his houses “should have dignity, charm, and look lived in,” all traits Brittingham House still embodies today. The university initially used the Brittingham House as office space for the Polar Science Research group of the UW‑Madison’s Geology and Geophysics Department until 1968, when Chancellor and Mrs. William Sewell became the first to use it as an unofficial chancellor’s residence. Inadequate heating, however, made it less than an ideal home during Madison winters. In 1969, when President Fred Harvey Harrington and his wife Nancy Harrington were prospective residents, the house received much needed new wiring, heating, and plumbing. A sunporch off the living room and a new garage‑apartment wing were added. Mrs. Harrington worked with the state’s architects and the University’s Planning and Construction Department on the changes. 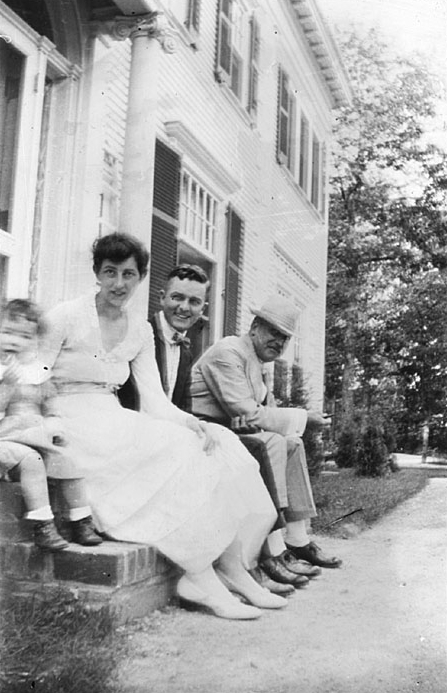 The house was not ready for occupancy, however, until after Dr. Harrington had left the presidency. Additional remodeling, renovation, and refurnishing, funded by the Brittingham family trust, was directed in 1973 by Margot Donald, the daughter of Margaret Brittingham Reid. The house became the official UW‑Madison chancellor’s residence the same year. Brittingham House was designated the official residence for the UW System President in 1977 when UW-Madison Chancellor Edwin Young became president of the University of Wisconsin System. The historic Olin House in University Heights, which had previously been the president’s official residence, then became the UW‑Madison chancellor’s residence. 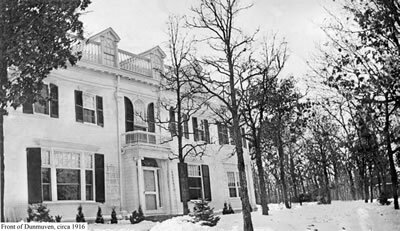 In addition to being home to the UW System president, the Brittingham House hosts as many as 3,000 visitors each year at numerous UW System events, including formal dinners, receptions, and meetings. Today, the Brittingham House’s 15-acre grounds, with a combination of wooded areas and formal lawn and gardens, are among the few undeveloped areas on Madison’s west side. The gardens are enjoyed by hundreds of visitors each year. Sprawling across the grounds are groves of maple, pine and spruce, originally installed by Thomas Brittingham, Sr., which provide food and habitat for wild turkey, fox, owls and a variety of other wildlife. Two other buildings reside on the grounds: the old carriage house and the squash house. The squash house was the recreational center housing the squash court, game room, and locker rooms. Adjacent to the squash house is the tennis court, but a swimming pool, one of the first in the city, no longer exists. In addition to its striking architecture, Brittingham House is home to ongoing displays of loaned artwork from local art sources. Permanent pieces include an oil portrait of Thomas Brittingham, Sr., by J. C. Johansen, an 18th-century Chinese screen, and an Audubon print. The Brittingham House Art Invitational, 2001 to 2004, was an exhibition to showcase the artwork of visual artists from faculty in the University of Wisconsin System. Oil painting of Thomas Brittingham, Sr., by J. C. Johansen.